One of the more enjoyable Presley pictures. The Century 21 Exposition, also known as the 1962 World’s Fair is the setting for Elvis Presley’s 1963 film, It Happened at the World’s Fair. Presley stars as Mike Edwards, a crop duster whose partner Danny Burke’s (a pre-2001: A Space Odyssey Gary Lockwood) gambling habits causes the pair nothing but trouble. While Edwards doesn’t trust Burke with the money they have earned and keeps it locked in a safe, unbeknownst to him, Burke has a key and takes the money to go gambling. Meanwhile, Edwards finds time for skirt chasing, singing, “Relax” to a sultry Yvonne Craig, who resists his advances long enough for her parents to return home and her dad to threaten to shoot him. This is standard ’60s Elvis movie fair, but Presley’s chemistry with the not-yet Batgirl is undeniable. This would not be her only Presley film. Burke’s gambling turns dangerous when the group he is playing cards with realize he has stiffed them out of a lot of money. Luckily for him, Edwards shows up to rescue him (and get into the prerequisite Elvis movie fight). The pair flies back home, only to have their plane repossessed by an angry sheriff looking to collect on $1,200 that Danny owes. Not knowing what to do, the pair goes hitchhiking. Along the way, they run into Walter Ling (Kam Tong) and his young niece, Sue-Lin (Vicky Tiu), who are headed to the World’s Fair. Ling agrees to take them as far as the Fair and the pair boards his truck. It’s not long before Sue-Lin produces a ukulele that needs repair, which Edwards happily does before singing “Take Me To The Fair.” In different hands this scene would be corny, but Presley and Tiu’s enthusiasm make it a fun scene and a highlight of the film. When they get to the Fair, Ling is unable to accompany Sue-Lin and Edwards agrees to take her in his place. At the same time, Burke goes looking for a friend, Vince Bradley (H.M. Wynant), whom he thinks can help them with their financial woes. Edwards takes a liking to Sue-Lin and spoils her rotten, letting her eat everything in site. Naturally, she gets sick and has to see nurse Diane Warren (Joan O’Brien), who Edwards is immediately attracted to. She resists his advances and Edwards pays a young boy (an uncredited Kurt Russell) to kick him in the shin so she’ll have to see him. As Edwards begins to win Warren over, the pair run into Russell’s character again, who throws Edwards under the bus, asking if he wants to be kicked in the shin again. Warren is furious and wants nothing to do with Edwards after this. Burke later wants Edwards to help him do a cargo run to Canada for Bradley, but has to figure out a way to get rid of Sue-Lin, who Edwards had been protecting since her uncle had gone missing. He arranges for a woman to call child services, posing as Warren and Sue-Lin is taken away. Heartbroken, Sue-Lin manages to run away with Edwards staying behind to search for her while Warren tries to prove it was not she who made the call. Presley had not become completely jaded with Hollywood yet when this picture was filmed and as such, delivers a more focused performance. The World’s Fair footage makes for an interesting time capsule while the music is better than some of the later Presley films, making It Happened at the World’s Fair one of the more enjoyable Presley pictures. This DVD is also part of the Elvis 75th Anniversary DVD Collection. 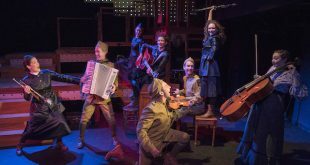 A smart, crisply written book by Peter Mills and Cara Reichel links a sequence of superb musical numbers, recounting in the best musical-theater tradition the little-known story of the U.S. Army's WWI female telephone switchboard operators.